Democrats flipped a variety of statewide offices including governorships in Michigan, Wisconsin, and North Carolina. GOP-controlled legislatures in those states have all taken measures to dilute the power of those higher offices held by Democrats. In Wisconsin the Republicans also seek to limit early voting and make other changes that restrict Democratic voter turnout. 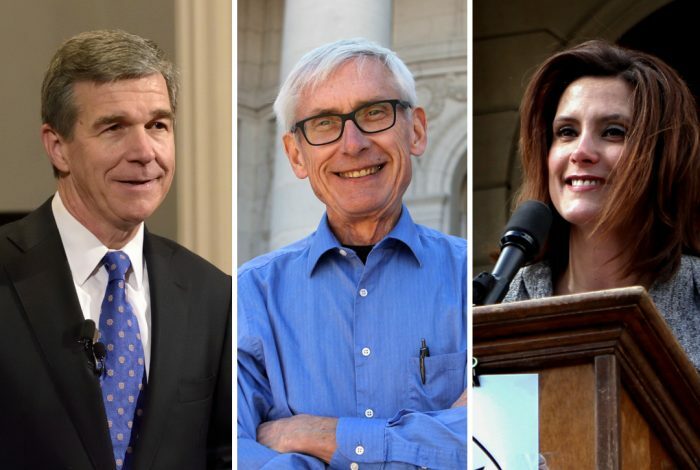 About this photo: Left to right: Governors elect Roy Cooper (D-NC), Tony Evers (D-WI), and Gretchen Whitmer (D-MI). Photo credit: oy Cooper / Flickr, Tony Evers / Wikimedia (CC BY-SA 2.0), and Gregory Varnum / Wikimedia (CC BY-SA 4.0).